This Montreal Steak recipe has a sweet and spicy rub that is sure to delight your friends. Even better, it is simple and easy to do. Team the recipe with grilled Corn in their Husks and you have a crowd pleasing meal. At our house we grill every Saturday night. Hubby is the grill master and I’m the one who comes up with the seasonings. It gives me a “sort of night off” from cooking, since all I have to do is put the meal together in my head and not on the stove! 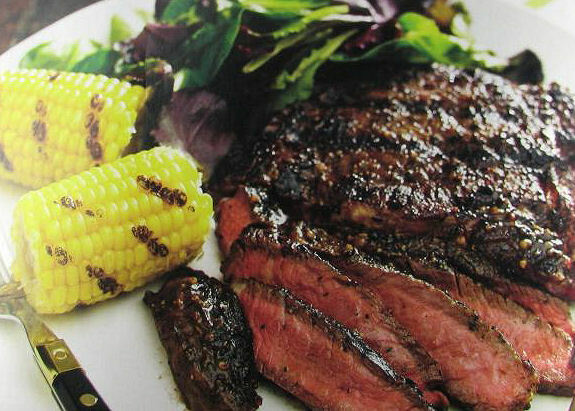 McCormick grill mates Montreal steak seasoning is the secret ingredient in my latest grilled meal. It is a combination of coarsely ground peppers, garlic and spices for bolder tasting steaks and burgers. I combined it with red pepper flakes for some heat and brown sugar to give it a sweet hint of flavor, too. It made a super tasting meal and both hubby and I loved it. For more great recipes, please visit my Facebook cooking page. It's grill time. Delight your family with this delicious Montreal steak. It has a sweet and spicy rub that will become a favorite. Blend together the seasoning, brown sugar and red pepper flakes in a small bowl. Rub the seasoning mixture into the steak so that the meat is coated thoroughly. Grill the steak on medium high for 6-8 minutes each side until the meat thermometer registers 145 degrees. Rest for 3 minutes before serving. Cook the corn in their husks with the spice mixture mixed with butter. You can cook them on the grill in the husks for about 5 minutes.